I became motivated to investigate different feeding systems after I noticed how horses kept in any kind of enclosure other than pasture, became fixated on food! Even though they received the right amount of hay and/or feed for their body weight and activity level, they were psychologically “starving”. Of course, since a horse’s stomach produces acid (for digestion) continually, it makes even more sense why a horse fed even 4 times per day would become distressed about food. When I had my horses on pasture for 10 years in Alberta, they never showed any anxiety about going out for rides, or impatience to get back home, or any tension at feeding times. So I think the contrast with horses kept in stalls, paddocks, or dirt enclosures was really striking for me and I personally do not enjoy hanging out with a horse who is always thinking about food, or trying desperately to get a mouthful of grass. On the flip side, if you give a horse in a stall or paddock 24/7 access to unlimited hay, they can overeat and end up with laminitis, colic, founder, etc. The solution to this dilemma is slow feeders filled with low sugar hay! Slow feeders allow the horse access to hay and the ability to “graze” for most of the day, yet only consume a healthy amount of hay. 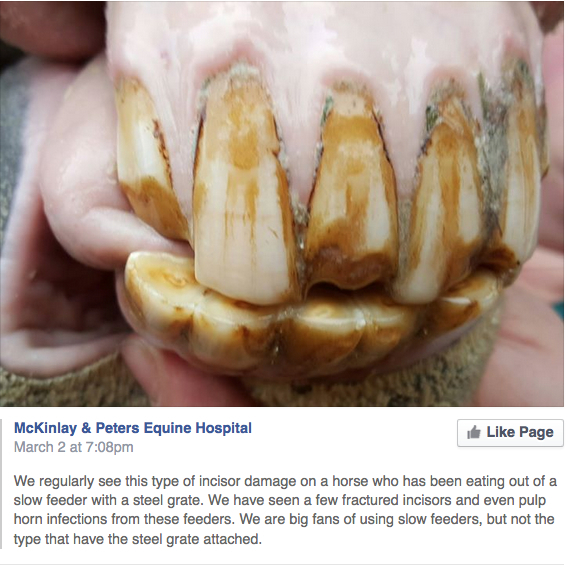 I keep an eye on my horse’s teeth, but I have had 7 different horses eating from my metal grate slow feeders (2″ x 2″ openings) for over 4 years and all teeth are fine. 2. You must have a trapping method that prevents the horse from grabbing the grid and tossing it out of the feeder. Not every horse will figure this out, but some do. Many have found 1.5″ holes to be the best size for a hay net slow feeder – especially if your horse is new to hay nets, or you have a larger horse. For smaller ponies, or those very skilled at extracting hay, a 1″ net might be better – but then definitely check their gums regularly. Nag Bags and Eco Nets are popular brands for hay nets. I prefer Handy Hay Nets for ease, softness (non-abrasive) and durability. If your horse is shod, then your hay net must be in a protective feeder (poly, metal or wood) as horses will paw the net and may get the heels of their shoes caught. If you’re considering using hay nets, then check out this fabulous page of ideas for how to load, hang, clip and position your hay net. 4. Your slow feeder should be as close to the ground as you can get it. This simulates the natural grazing position that is best for the neck and topline (spine) of the horse and also helps prevent hay dust inhalation. 5. Set up your slow feeders the same way you set up your hay piles – with one extra. This prevents stress and anxiety from the dominant horse(s) moving the others off the feeder. So if you have 4 horses, you might get a 4-horse slow feeder + a 1-horse slow feeder. Or two, 2-horse slow feeders + a 1-horse slow feeder. Think about your herd dynamic before you select the size and number of feeders. For example, if you have a super pushy horse who likes to eat alone, then he might take over the 4-horse feeder for himself, leaving your other 3 to share the 1-horse feeder. So then you would need a different configuration to get it to work for your herd. Also be prepared to do what you think will work and then watch them for a week or so; make adjustments as needed. 6. Make sure your feeder is made of non-toxic materials and untreated wood. Remember that your horse will be inhaling for hours in the feeder and touching it with his lips (mucous membranes are highly absorptive). Of course, also avoid sharp or protruding parts. There are three models of the Drury Healthy Horse Feeder available. They have grid systems for your pasture, or your horse’s stall, and a hay net system for a round bale. What I like about this feeder is that it is low maintenance. What I don’t like about it is that the horse will be twisting his head/neck to the side to grab each mouthful – this is an unnatural position and movement to be doing all day, every day, and perhaps your horse will need ongoing chiropractic adjustments. However, depending on how you position your hanging hay net, your horse may be in a similar position anyway. 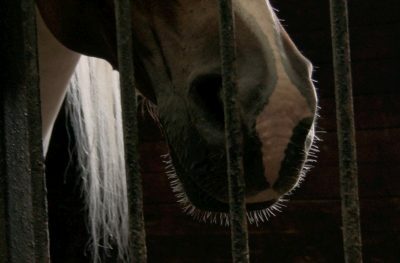 Now if you live somewhere extremely cold, then you may not want to use a metal grate slow feeder as the horses’ lips or tongue may get stuck on the metal! So this resident of the Yukon in Northern Canada came up with the ingenious idea of using plastic puck board. 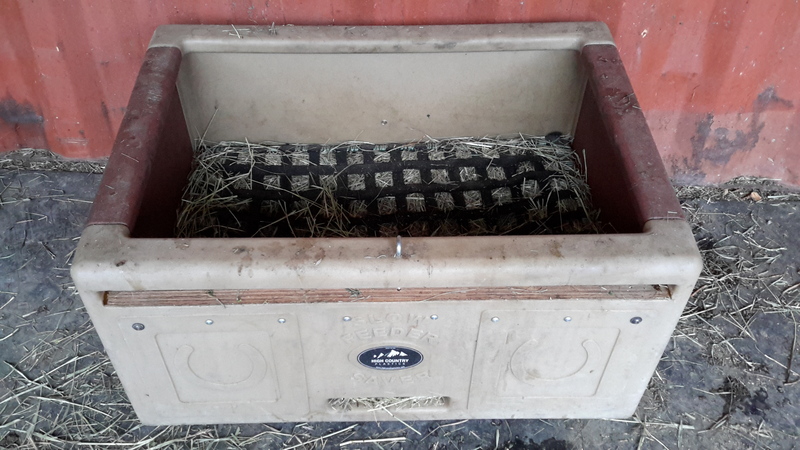 However, as you can see from the video, this box is too small for 2 horses and likely the dominant horse will be well fed and the other one… not so much. I like to follow the same rule for slow feeders as with hay piles. I have one extra. That way the dominant horse can move the others around as much as he/she wants and there is always a place for all to eat. This really reduces stress/anxiety around feeding – which is not good for any being! This is a great video that shows all the details, not only of construction, but of how the horses use the feeders and how it changes their psychology. So that even when your horses are eating the same amount of hay per day, you can see how a feeding system that simulates grazing can transform your horse from ‘psychologically starving’ to satiated. I’m not crazy about his string tie-down system though. I don’t think that will hold up well over time. 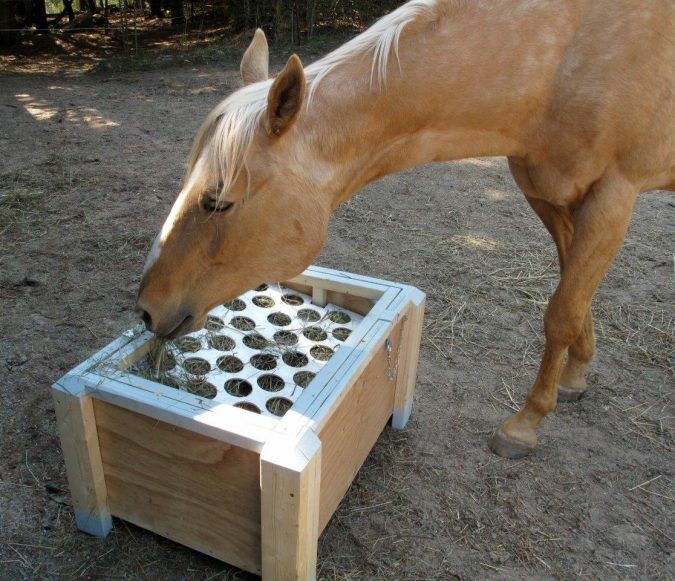 This Slow Grazer slow feeder has everything I was looking for – really easy to load, no protruding parts, perfect size grid, and a sturdy lid to prevent a horse from lifting the grid out and tossing it away. The underside (that contacts the ground) is pressure treated to prevent the wood from rotting – but the rest of it is not. This is a really good thing as I don’t want my horse ingesting chromium and copper from pressure treated wood. And (at the time of writing) the price is excellent – only $275 for a 4’x4’x28″ feeder. They also sell the plans if you have the skills and desire to build your own. Joe (the owner) told me the feeders can sit out in the rain and are good for 8-10 years. Then you may need to replace the gussets in the corners. I ordered two of the 4’x4′ feeders for the three horses in my pasture. This will not only suffice for right now, but will likely still work if I happen to add another horse or two to my pasture. However, I have had 8 different horses eating from these slow feeders and she is the only one who stomps on the grates like this! 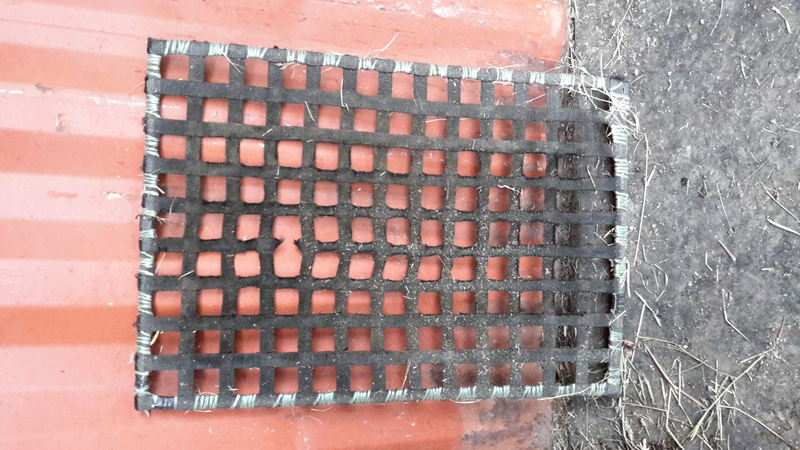 So, since she joined the herd, I have had to switch to a mix of this size grate (2×2-inches) and a 4×4-inch grate, and a 2″ hay net, so my Belgian has a few choices! After using it for three weeks, here’s my review of the pros and cons of this feeder. First of all, the lid/locking mechanism looks like a good one. It is VERY sturdy and nicely heavy. I roped it to a large beam in my barn using a chain and there has been no damage whatsoever. Since I have 4 young, playful horses in my herd, I would not leave this feeder loose (as they show in some of their videos) as I’m pretty sure they would crack it. Here’s my feedback on it’s function: I packed it with large, stalky hay (alfalfa) and it worked great. 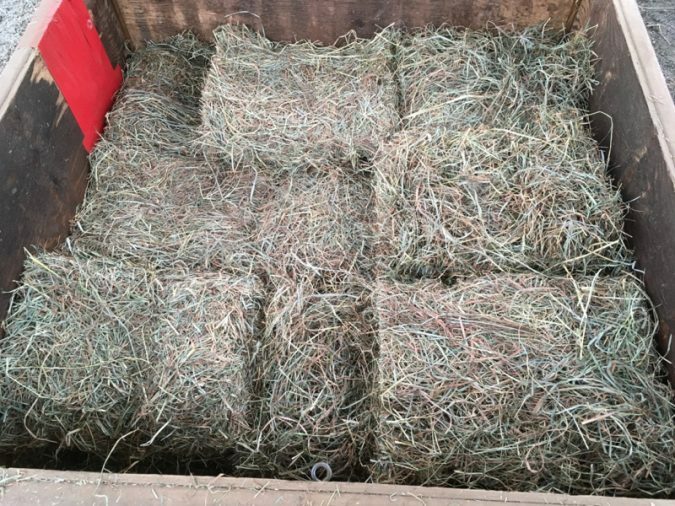 When I packed it with soft strands of hay (orchard grass) it didn’t work so well – they couldn’t get it out and ended up mashing/crushing it into little bits that were then impossible to get out. I also purchased the unit with Draft-size openings (the largest holes available). I was trying to figure out why this could be – since the orchard grass works best in both my metal grate slow feeders and hay nets. Then I realized that due to the shape (about 2 foot wide barrel) the horse cannot really get their head/mouth sideways. So they can’t use a lot of angles to pull the hay out. They can mostly only eat straight on and tilted a little bit to the side. If you watch the video above, you’ll see that the the horse is eating a stiff, stalky rye grass and as you watch his mouth action you’ll see what I mean about how they can’t angle too much to the side to get to the hay. However, as the weeks wore on, they gradually learned how to extract the orchard grass – my system is to use low-sugar orchard grass in my slow feeders and give a small amount of alfalfa loose. However, within a month of them figuring out how to pull out the hay, they also figured out how to get the lid off! And not just once in a while, but every single time I filled it. The other issue I noticed is that once the horse starts to eat down the hay, their head is disappearing into a hole with no visibility whatsoever. This is fine for the dominant horse or two, but others further down the pecking order will only eat from it when the more dominant ones are far away – because they can’t move to get out of the way if they can’t see the boss horse coming! If you had a horse in a stall, or a couple of very docile horses, it would probably work just fine. I don’t know whether Bermuda or Teff would work well in this feeder either. Unfortunately, due to them being able to unlock the lid every single time, I have had to retire the Porta-Grazer and it now sits in my tack room. I’m not sure which horse is removing the lid – I do have one horse who can undo the chains looped around my gates, so perhaps he’s the culprit. Regardless, once the lid is off, they just pull out all the hay and stomp it into the ground – $15/bale and a huge mess to clean up. On the plus side it is much easier to pack/load than a hay net! The Hay Pillow is a type of hay net that is designed to be placed directly on the ground. It has a solid back and sides to prevent the hay from getting dirty and dusty. All of my horses like this Hay Pillow – except for my Belgian who dislikes all hay nets – and if you live in a dry (or snowy) climate, this solution would work well. It wouldn’t work well for a muddy, rainforest climate like mine though – unless I wanted to clean it regularly! The other point to keep in mind is that the Standard size only holds 8 pounds of hay, so you would need to refill several times a day. Again, this doesn’t work for me as my 4’x4′ Slow Grazers hold 200 lbs of hay – so I’m only filling feeders once every 3 days, which I prefer. However, I might want to use a Hay Pillow if I ever wanted to slow down my horses consumption of their daily alfalfa. Currently, I feed alfalfa loose – but the Hay Pillow would be just the right amount for each horse. So I will definitely keep it in mind. Here’s a great article on keeping your horses mentally and physically comfortable when eating. 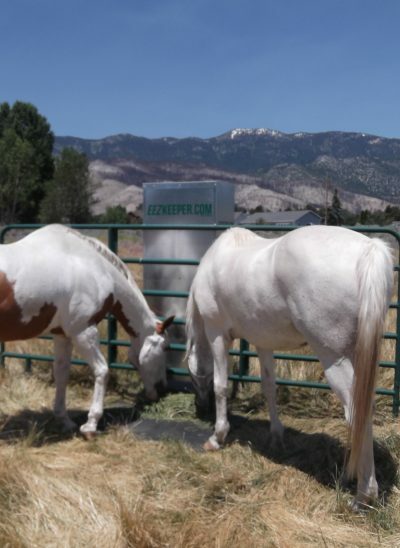 If you can cover the slow grazers, then I would go with the 4’x4’ feeder – if you had two of them for your 3 horses, then you would probably only need to fill once every 4-5 days or so. For my slow feeders, every 2 weeks, I let the horses eat them down to nothing (I rotate this – emptying one feeder at a time – so they are never without food, unless it’s the summer when they can graze), then I scoop out the dusty remains and refill entirely. The feeder also has holes drilled in the bottom for aeration. If you will have the boxes out in the open – getting rained on – then I would go with 2’x2’ boxes so they can eat it before anything has a chance to go moldy. Although, if you only had ONE 4×4’ feeder, they would eat that down no problem, before any chance of mold. The Slow Grazer guy runs a boarding facility and has his outside in the open 24/7 – he said they’re good for about 10 years like that in the rainy Pacific Northwest. No problem with teeth or gums – I check them every month or so. I also adjust grate size according to type of hay – if the hay is easily pulled out, then I use 2×2” grates, or 2×4” grates. If it’s difficult to extract and breaks easily I use 4×4” grates. The KEY to success is using LOW SUGAR hay. I purchase my grates from this vendor and then I cut them to size myself – with bolt cutters I purchased from Home Depot. Many people stress themselves trying to find THE perfect hole size for their slow feeder, when really, it depends on the hay. It is such freedom to have access to a variety of grate sizes and to be able to experiment and cut my own (I have slow feeder boxes in 3 different sizes). Note that the vendor calls these mesh panels, corral panels, cattle panels, hog panels, etc. – so try a variety of search terms when trying to find a vendor in your area. I wonder if the teeth/gum problems occur when people are making the horses extract via 1” or 1.5” openings… You don’t need to to restrict the rate of feeding if you use low sugar hay! I have drafts, half-drafts and Andalusian – all known to be ‘easy keepers’ and to gain weight in a heartbeat – so I think they’re a pretty good test group. Now, I couldn’t get low sugar for much of this year (due to drought in the growing season) and two of my horses are now porkie-pies. But, when the boxes are stocked 24/7 with low sugar hay, no one overeats and all stay trim and healthy. I can’t emphasize enough, that for slow feeding free-choice, ad-lib, or 24/7 hay, the hay MUST be lower than 12% NSC. I prefer 10% or lower. I look forward to the day when hay growers get savvy to the demand for low sugar hay and also start growing a greater variety of forage crops! If I was going to start over, I would not even bother with hay nets and just go straight to the slow feeder boxes with grates 🙂 Unless you’re feeding round bales – then a hay net makes sense. Well, now that you have your slow feeder in place, you need to make sure you fill it with the right kind of hay to keep your horse healthy and at a good weight! And remember to check front teeth and gum line every month or two, ongoing, to ensure your horse is not damaging their mouth on your slow feeders. was never comfortable in sub freezing weather. QUESTION: Great article, Jini. I wouldn’t have thought of the plastic netting irritating the gums but now i can see how that could get really uncomfortable! Also, i’ve never liked feeders where the horse has to pull the hay from the side. Gives me a sore neck just thinking about it! I have a question… I’m plan to feed my old timer (30 YO) with the youngsters (1 & 2) once winter arrives. Will the old guy get enough on a slow feeder? Also horses needing to gain weight? I’ve put some thin rescues on round bales and they gained almost overnight. Have you ever had thin horses on slow feeders, and if so, how did they do? TY! Oh and the Facebook discussion continues – this is also a good point, so again, I’m posting it here too! COMMENT: It has also been my experience that thin horses gain and overweight horses tend to lose, kind of a self regulating process? Of course I have always had an age/condition specific “mash” for each horse in conjunction with the slow feeder. Is that what you would recommend Jini? We deigned our feeder to overcome the issues associated with trickle feeding hay. Hi Michelle, I took a look through your site and it’s a great design and excellent construction! I would also add a video to your homepage showing someone filling the feeder, securing the lid, then securing the unit in a stall and out in the pasture. When people buy online, they need a real clear picture of how it will work for them. Your Q&A are great, but a video will answer the remaining doubts that may be stopping people from buying. I understand your production costs must be high – so when asking people to invest this large sum of money, you really have to give them a clear vision of HOW the product will work in their particular environment. Hi Jini – thanks so much for our reply. Your suggestion of a video is a great idea – we have a video on youtube here : https://www.youtube.com/watch?v=eU56NWuknss so we will work to get that up on the website. We have tested the units and have had feedback from clients about behavioural changes – more relaxed and some horses have stopped box-walking with Harmony. So we are only in the early stages of getting Harmony on the market but the feedback has been great on behavioural changes. I bought 3 of the Drury Slow feeders. Spent over $3000. They are crap and do not work. The horses could not pull the hay through as it was too rigid. I was told to go out hourly and pull the hay out with the hay hook. Doing thst whike Feeding 50 horses ? No thanks. They are sitting in a heap behind my hay shed. DO NOT Buy that kind. We use NagBags and Econets now. Fairly satified with them. Ouch! That’s gotta hurt. Thanks so much for sharing your experience. Now that I watch the video again, 2 things are not clear to me. 1st, what happens to the hay bales stacked in the middle? Are you manually supposed to come back each day, cut the strings and put flakes down the sides? Because I can’t see how the horses could get to those center bales. And secondly, I know from my top-load grates that gravity is what keeps the grate pressing onto the hay so the horses can keep pulling hay through. 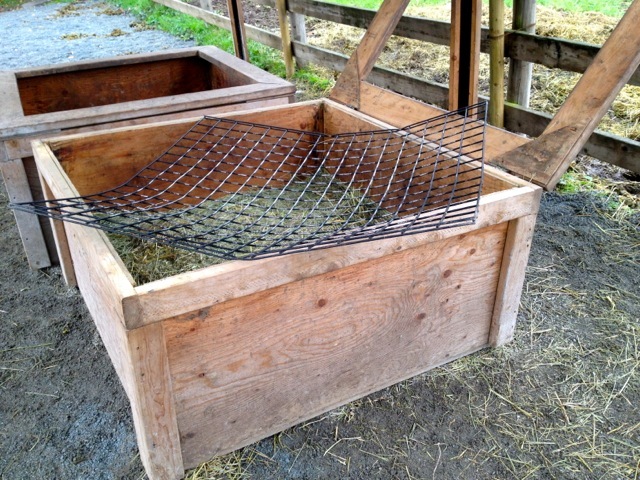 But in this design, how can the horses get to the hay once the top layer (that is pressing against the grate) is gone? I see how this design could just not work well! And btw, when you subscribed to this blog, there was a typo in your email address, so your subscription hasn’t gone through – just enter your info again and all should be good. Hi there just read your comments on our feeders and would like to have a conversation with you about your problems. Where your feeders the 4 day version or the 6 day version? That’s a great design John and I didn’t even know those existed! Mine would not waste a drop of their supplements and herbs so I was not even aware of this problem. But it makes sense for older horses too who are often on a fair amount of grain/feed – and slowing them down might help them to chew and get more in. Thanks for sharing this with us! Thank you for the good information. I live and board my horse in the high desert of Central Oregon. She is on a dry lot with anywhere from 5 to 7 other horses. The horses are currently fed on the ground with the hay contained in tractor tires with much of the side walls cut away. While there are enough tires to make sure there is always one more than there are horses they are still eating off volcanic sand and fed three times per day. I would much prefer a slow feeding system of some kind so I am in the process of researching and I found your comments quite helpful. I was wondering if you have ever checked out the “Porta-Grazer” and if so what your opinions of it are? I will be doing some more research to see if there is any kind website where people have rated it. It seems to be a pretty decent feeder, I just wonder how long they last/would the horses destroy them since they are made of some type of plastic. Their website is: porta-grazer.com. Anyway, again, thank you for the information. Hi Carol, Thanks for sharing this! I looked at their site/videos and my concern was exactly the same as yours! Especially since I watched one of my horses destroy a huge, tough water tub last week by simply hooking his foot inside and pulling until an entire chunk of the bucket that was roped to the wall split off from the main bucket. It’s one of the best designs I’ve seen though – I like the way the lid rotates. So I ordered the biggest one (corner feeder). Shipping to Blaine WA is $50 and it will arrive in 1-2 weeks. I’ll post back here and let you know what I think of it after I try it out for a few weeks. If anyone’s going to break it, my Belgian mare will! She continues to pound/bend the crap out of the metal grates. And she’s ripped through 3 hay nets so far. So we’ll see what she thinks of this one – fingers crossed! Hi, Mini. Just wondering what you think about the portagrazer you said you bought. It looks really interesting to me. Hi Debie and Carol – Well I bought the XL feeder and the lid/locking mechanism is a good one. It is VERY sturdy and nicely heavy. I roped it to a large beam in my barn using chain (see pic). It has been up for 3 weeks and no damage whatsoever. Here’s my feedback on it’s function. I have packed it with large, stalky hay (alfalfa) and it worked great. When I packed it with soft strands of hay (orchard grass) it didn’t work so well – they couldn’t get it out and ended up mashing/crushing it into little bits that were then impossible to get out. So now I have ended up just using it as another feeding station when I put out the loose alfalfa. My system right now is to use low-sugar orchard grass in my slow feeders and give alfalfa loose. The other issue is that once the horse starts to eat down the hay, their head is disappearing into a hole with no visibility whatsoever. This is fine for the dominant horse or two, but others down on the pecking order will only eat when the more dominant ones are far away – because they can’t move to get away when they can’t see the horse coming! If you had a horse in a stall, it would probably work just fine. I don’t think Bermuda would work well in this feeder either. Basically you would need to stick to hay with a good stalk. Or perhaps if you fluffed the hay really well (so packed in less) that might work too. On the plus side it is easier to pack than a hay net! Hope that helps. Dear Jini, as the person who invented the Drury Healthy Horse feeders. I would like to inform you and the readers that our ( new name) 6 day hard sided feeders do not cause any problems with the necks having to be adjusted. We have approx. 300, 6 day slow feeders all over North America. We have done numerous studies on every aspect of how the horses eat from our feeders over a 6 year period. Horses are very intelligent animals and are way too smart to bend their necks until they are stiff!!!!!! I think the word anthropomorphism is how I would describe your thoughts above. I have personally sat and watched horses eating from the 6 day feeders, I have spent hours observing them eat and I can tell you with confidence that they eat from different sides and angles ever time they come up to a feeder. The feeders where designed to have the horses eating with their heads down. A comment on the steel mesh causing problems in cold weather, not a chance of it happening. Just because you and many others as young children licked a cold fence and got stuck to it does not mean that horses do. We live Barrie Ontario where January, February and much of March often fall to minus 25-40 below, we have never or any of our customers ever had any problems with horses sticking their lips or tongue to the feeders. Eating out of our feeders is not like putting a bit in a horses mouth. 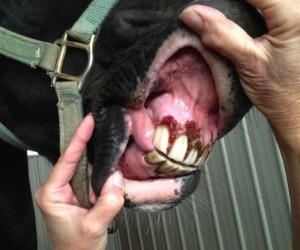 We have consulted with numerous Veterinarians and they tell us that horses mouths,lips and tongues are not designed to allow this to happen. Again anthropomorphism comes to mind. Please please don’t use how you feel as to how the horses react. Please provide some evidence of your comments it may be helpful in our on going research . Hi Bob, Thanks for providing all this information – that’s what this blog is for! However, I didn’t mention anything about stiff necks, I said that for a horse to eat/graze sideways is an unnatural position. No anthropomorphism – just pictorial evidence. Unless a horse is stripping bark from a tree, grazing on grass or forage involves a different neck action to your slow feeder, that’s all I am saying. Glad to hear the steel is okay in freezing weather. In a number of the videos I watched (in the comments section) residents of Northern Canada were raising this concern. Personally I have no experience with this aspect. I haven’t seen a slow-motion video of horses eating from a slow feeder, but I have seen one (shot by an equine dentist) that shows just how much the tongue is used when horses are grazing. Any feedback on the Hayboss Feeders? Great overview! My new Tumble Feeder invention addresses many of these issues with the added bonus of transporting the hay for you over any terrain. Plus it makes it fast and easy to rinse allergens from hay. See it in action https://www.facebook.com/tumblefeeder/videos/621101214762944/ Glad you mentioned the visibility issue. I have a short clip on fb that addresses that too. Jini, Just saw this post and wanted to add that I have used a porta grazer in the past and had it secured. Then one morning I found my horse with one of his front legs in it all the way up to his elbow. Lucky for me he knows how to give to pressure, so when he tried to get his leg out, he felt the pressure and stopped. (This could have been a major wreck with a higher strung horse). He was probably like this for 20 minutes before I found him stuck. I had to unsecure the feeder and then tip it at an angle for him to be able to get his leg out. I have never secured it since. The only other thing I don’t like about the porta grazer and other feeders like it, is that I find that my horse would put his head into the barrel to get some hay and then pick his head up out of the barrel to wither height or higher and chew. I figured he did that because he wanted to be able to see. (But a more natural eating position is on the ground while chewing). I no longer use a slow feeder, but if I were to, my favorite is the Hay Pillow because the horse’s head is on the ground and has all of its vision available. It is not obscured by its head being in a box. Thank you for the great information. Thanks for this Mary – that is a very good point to consider! Mine all have pretty big hooves so wouldn’t fit in the holes, but yes, I can see how that could happen. The one I bought remains secured to a pole in the barn, but they don’t like to eat from it and I hardly ever have to fill it, because they eat from the others instead. Like you wrote, only my 2 dominant ones will eat without continually pulling their head up to look around. It is like eating down a dark hole! I think this feeder would be best for a stalled horse, or a horse in a paddock – especially unsecured so s/he could roll it around and have some fun with it. Interestingly enough, I received this email from Porta-Grazer after I reviewed their product. I just love how he assumes I didn’t fill it properly! Instead of realizing that because I purchased their largest one, an entire flake of hay lies flat inside – no folding required, or possible! Well, unless I folded a flake, held it down with one hand, while folding and securing another flake right next to it using my only other free hand…?? Plus, his answer still doesn’t take into account the other issues I raised, and now you have added another one. If I were them, I would produce a low-to-the-ground, rectangular version. I appreciate the time and expense taken to review the Porta-Grazer. I am disappointed in the fact that you obviously did not follow the instructions supplied with our product. When the hay is not loaded according to instructions and start up instructions are not followed you will experience negative results. When instructions and start up are done correctly the horse turns the pan to access the hay he does not push down and jerk the hay through the holes. Each bite is sized and torn off to the horses individual bite size as done when naturally grazing. All other slow feeders are designed to force the horse to slow down which is an interesting concept considering the owner has no idea how fast the horse is supposed the eat! We have two porter grazers. One was a defective product the other was fine. I called and hate to say no interest to help. Would never recommend to any person to purchase. Thanks for sharing Linda. I’ve now removed my Porta-Grazer from the barn because they have figured out how to get the lid off – every time. So then it just made a huge mess. Too bad, as it’s a great idea. Might still work well for stalled horses though. I have two Porta-Grazers for my two horses and I’m generally happy with them, although I have had some of the same experiences. They were certainly expensive but I feel like they are way better than just putting the hay out on the ground in my paddock! My Percheron is pretty good at getting the lid off if I fill it too full, but if I don’t fill it much then what’s the point? It seems like how dense or fluffy the flakes are makes a difference to how the lid behaves. I also find that there are some flakes that just get “clogged” and won’t feed out. But overall I really like the Porta-Grazer because it holds almost half a bale, which is a reasonable amount for being away at work for the day. I also like that I can move it around – in the middle of the paddock usually, or under the run-in if it’s going to rain, or even out in the pasture if I want the horses out, but not to eat up all the hay so fast. With just the two horses, I don’t think that the head-n-the-barrel position creates much anxiety. Overall I feel like they have saved me a great deal of mess, and kept my horses much happier when they’re confined to the paddock and I’m away all day. What if you don’t have a cover for round bales, what is the proper way to set up the bale in the weather? I just had four slow grazing boxes built for my horses. We used puck board and made 2 3/4 inch holes. The two big horses can eat from it but they don’t want to. My old 30 year old arab refuses to eat from them. He has started on them and then just walks away out into the side field and forages, I have had to separate him and give him his own loose hay. Well there’s nothing wrong with your boxes Jocelyn – maybe you just need to cut the holes bigger? Or even just join 3 holes together to make a triangle cut-out – because 2 holes joined may not be wide enough… But I would experiment one at a time, or with both! You could take one board and join the 2 holes together into 1 slot (so 2 3/4″ wide by however long that is). And then take another board and join 3 holes together in a triangle shape – even if you can just fit 4-5 triangle cut-outs per box. Then put them both out and see what the horses think. In the photo you’ve posted here, it doesn’t look like this horse is having trouble, but the other holes do look small to me… Remember, it takes time for horses to adjust to new things and you always want to give hay loose in addition to the boxes (or nets) when introducing them to new things. Remember, I have two different size grates that I use, depending on the type/texture/stalk of the hay. One grate is 2×4″ and the other is 4×4″. Jini the two big horses can eat out of it ok. They ate out of the first box together and ate right to the bottom. Gonzo worries me. He tries it then walks away and goes into the side field. Like I said the edges of the holes are rough and hurt the skin on my thumb when I pull the hay up to get them started. I wonder if the person in Alaska who came up with the puck board idea has any feedback to that? Do you have any idea of how to reach that person? I am going to ask to have one piece of puck board made with 3 inch holes and see if they like that. I have forwarded your message to the guy who made them for me to see what he says. Didn’t want to use the grate because in winter here it wouldn’t be good to have their tongues on metal. The nets they bite through in minutes. That’s a good idea – to have 3″ holes. Also sometimes a horse refuses at first, or refuses if it’s too difficult. Let me know what happens with the 3″ holes. Also can you sand puck board – perhaps with a super-fine finishing sandpaper, like they use on drywall before they paint? There is very little difference in the look of 2 3/4 inches and 3 inches but it might make the difference. The holes were sanded but maybe not enough. They are also etching lines across the puck board with their teeth. It seems to be a rather harsh material for them to be constantly working at. I would think the grates would worse or the same though. We are going to try 3 inch holes. I will let you know. Puck board is pretty expensive but we have enough to make two more and experiment. Then whatever works we can get another sheet and make them that way. I find the texture of the hay makes it easier or harder depending on how coarse or the contents of it. I put the hay in loosely but it still seems to pack down when they eat. The two big horses will most definitely get used to it. I’ll let you know. So informative!!! I love it!! Currently mine are on savvyfeeders, but I’m looking into Hay Wise Feeders because I have to fill the savvy feeders at least twice a day. Have you seen either of those? I used a 1-bale-size plastic slow feeder with a metal grate with 2″ x 4″ openings for one winter. Despite googling it, I hadn’t seen any warnings regarding metal grates….I guess there just wasn’t much information a few years ago on this yet. So I thought it was great! 1 bale lasted 2 days (supplemented with alfalfa in 2 hanging nets that I filled daily), it was light enough to move around depending on the weather (under the shelter when it was pouring rain, out of the shelter when it was dry), no hay mess/waste (unlike the hay nets that sprinkle hay onto the ground), and my horses had hay 24/7!!! The only small issue I saw is that my Paso Fino would stamp on the metal grate and warp it a bit when the feeder was almost empty, to try and dislodge the fines under the grate. But when my horses had their vet check in the spring, I was horrified and ashamed to see that my big 27-year old warm blood mare had chipped about 2/3 of the enamel off the fronts of her teeth! My 18 year old, smaller Paso Fino had chipped one corner front tooth. So I don’t think the bigger opening size is OK despite what this blog post suggested, serious damage can still occur. So instead the following year I used the same plastic body of the slow feeder, but took the metal grate, cut out all the grating, and cut one side of a nylon hay net (with 1.5″ square openings) that happened to be the same size as the metal grate frame and tied it to the frame, and now they have a soft surface to push against. No more enamel damage, same convenience and 24/7 hay. Every year I spend a couple hours re-tying the net to the frame because the string does wear out. One plus with the soft net is that my Paso Fino can stamp on it all he likes now and there is enough give in the net that the frame won’t bend. 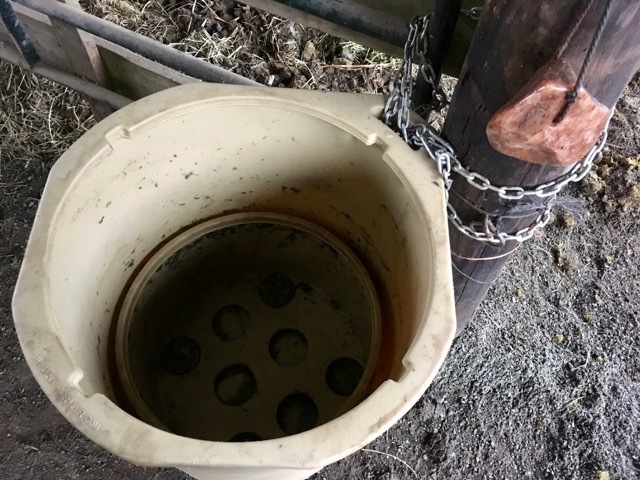 I have uploaded some photos of our modified slow feeder…after 2 winters of steady use you can see the net is showing some wear, but I still have the other half of this hay net saved, so I can switch one day when this one really disintegrates. I also use hanging Nag Bags and other nets and there hasn’t been any gum damage. Although my very smart Paso Fino has learned to lift and shake the hanging hay nets so all the yummy hay fines fall out first, which he gobbles up….then he’s left with having to pull out the less appetizing hay out over the next 24 hours. That’s a GREAT idea Kirsten! I love it, and so simple! I will also try your idea, because I think the ideal setup is to have 2-3 different slow feeders, so horses not only have variety, but can also choose the method that feels best to them. So THANKS for the detailed photos showing us exactly how you did it! – Put your bale in the wheelbarrow next to your feeder. Snip the strings. – Take the flakes and lay them FLAT into the feeder until the feeder is full. 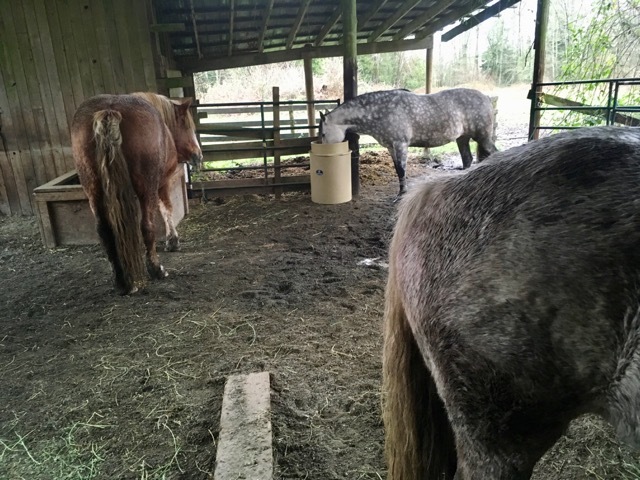 We figure that laying them flat enables the horses to pull them out in long strands, but placing the bale in the feeder and cutting the strings, puts the hay “on edge” so when they try to pull it through it breaks off, then they are ‘digging’ to get it out. Here’s what I mean – this is the way we must load them to prevent tooth/gum damage. If there’s any gap, we have to fluff the hay a bit, or pull it apart and stuff it in the gaps – you can’t just put a flake on it’s side to fill the gap! Good to know! But I don’t think I’ll use metal ever again!! Yeah, why would you? You’ve got a system that works great 🙂 AND you don’t have big Belgian mare who rips your haynets to shreds in 5 days flat. Well that’s an interesting option, but it’s not really a slowfeeder – more of a timed hay drop. One of the main reasons to slowfeed 24/7 is to take away anxiety or fixation on food (because it’s always available), and to more closely mimic a grazing experience. Neither of those objectives are me with that feeder. In fact, I’ll bet horses either stand around waiting for the next shelf-drop OR they know the schedule and make sure they are right there waiting! Still, for a horse confined to a stall or paddock, it would still be an improvement over getting fed a few times a day. Thanks for sharing it. 😉 Yes, a real CONTROLLED slow feeder and everything else you say plus a lot of performance horses 🐎 are prone to ulcers and one of the cures is keeping food on their system but not free feeding to avoid problems with overeating. The nets and the bags that make the wonderful claims, which have been around forever, are not effective as the animals can manipulate, learn how to eat faster and the strings and such are dentally destructive.💓💓💓This has been my experience over the past 30 years. Just found this ongoing evaluation of slow feeders, it’s very informative, and we make slow feeders for horses. Our latest model has been out in the market for 4 years and has benefits of a hardsided feeder but has none of the issues you have raised. Please have a look at our Helixfeeder for its ease of loading, natural grazing position, high capacity and it’s proven shod horse safe. Check us out on facebook at kiwifeeder or maybe you would like to try one and give us your feedback. It’s really interesting to learn about the different designs of slow feeders. I don’t own horses, but my sister does. I think she would be really interested to learn about an automatic feeder option. What total nonsense? I’ve fed all of our 149 rescue horses over the last 15 years through a nylon slow feeder and have never experienced one of the ridiculous claims you have made here. How to put people off with nonsense. What would be really good was for you to enlighten us with some actual science and facts? Thanks for sharing your experience. What’s a nylon slow feeder? Can you post a picture of one to show us what it looks like?